Lighthouse Beach- 5 minute walk away. Additional availability info: Minimum 3 night stay in the off season only. Weekly stay required in high season. This is a Saturday to Saturday vacation rental. Additional pricing info: 2 person kayak included. Add'l fees: $175 cleaning fee & $300 refundable security deposit. State and local taxes of 12.45% will apply. Awesome location walking distance to Lighthouse Beach, town, and baseball games!! Kayak was fun!! Bedrooms are cute, nice TV and living space although we were outside most of the time! Beautiful sunsets over Mill Pond!! Great week!! This was a lovely house for a week's vacation in Cape Cod. 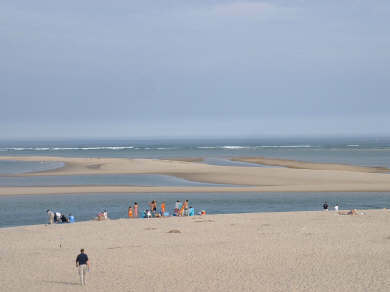 It is walking distance to Chatham Town and Lighthouse Beach. It is also down the block from the bay on which you can kayak (the house comes with a 2-person kayak). We were five and fit comfortably. It sleeps 6 but one room has a bunk bed. The front chairs face the bay and a great afternoon/evening sun. The side deck has a picnic table where we ate every night. There's also a BBQ and a great outdoor shower. The living was cozy and inviting and we sat around there each night.